1. The average young person is driving less and biking and taking transit more (24% more for cycling, 40% more for transit, and 23% less for driving cars). 2. Millennials and Generation X-ers are flocking to urban areas, congesting city streets and creating market demand for solutions that increase street flow without adding gridlock. People need robust transportation systems to move from home to work to shops. Low-stress bike networks can help relieve pressure on the street system. 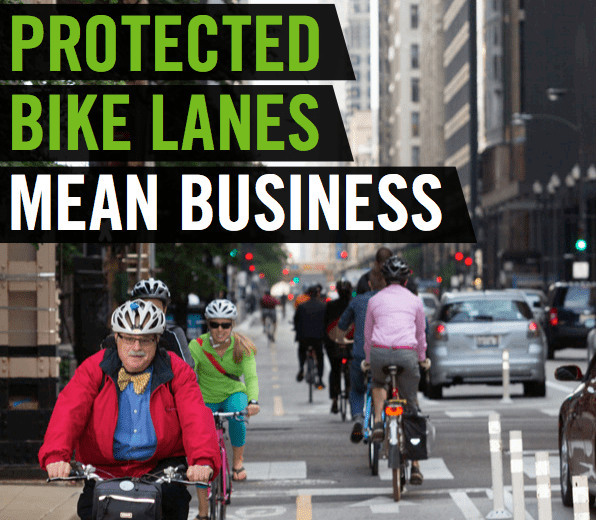 By making biking safe and pleasant for a broader range of people, bike lanes are bringing more residents, employees and customers to neighborhoods without swamping streets with traffic. They help free the street system for buses, freight and essential car trips. And as city dwellers prioritize dog-walking and bike-riding over sitting in traffic, investment is flowing toward streets that are built for connectivity and comfort. Studies show that homes near bicycle infrastructure appreciate in value more than equivalent houses away from bike lanes. 3. With health care costs at an all-time high, companies are scrambling to get more employees exercising regularly. People who ride their bike regularly benefit by having up to 32% fewer sick days and up to 52% increased productivity. 4. The most valuable customers are those who stop by often. People who arrive to a business on bike spend less per visit but visit more often, resulting in more money spent overall per month. When space is at a high premium, these regulars make for great customers.